Well, we've surpassed the one month date from the release of my book Dirty Shirt. I've been doing sneak peeks for many of the books central characters over the past eight weeks. This week I focus on my father who is a background character throughout the whole book. When I began writing the last thing I expected was that he would make an appearance, let alone become an undercurrent character for the duration. That's one of the cool things about writing, you never really know where it's going to take you. Sometimes you just start typing and go along for the ride. My dad was an avid outdoorsman. He loved to hunt, fish, canoe and ski. Of course, I have no memory of this, but from pictures I've seen and stories I've heard, it was how he relaxed. He instilled this love in my oldest brother Tom, who later instilled it in Rob, Paul and me. I think this, along with his love for his family will go down as his greatest legacies. Some of you may not know the full story behind my dad and I'll leave that for now as it is explained in the book and I don't want to be a spoiler. (Am I becoming a smart marketer now, too?) I'll leave it at telling you that he died when I was 5, so I don't have much memory of him. The few memories I do have of him are fairly vivid. For example I remember him letting me steer our car in the parking lot at a strip mall. I want to say it was near Lake McCaron on the east side of St. Paul, but am not sure. It was a thrill for me as a kid, and I've done the same for my kids on a couple of occasions. Passing the thrill on, I guess. Another memory was the time he took me (and I think it was just he and I) to what was then the Silver Coaches. It was a bar that has since become the North End Depot. I don't know if it was a Saturday stop or a night after work, but he only stayed for one beer. I remember having beer nuts and a soda and thinking how cool it was to have one on one time with him, even for a short time. In a cool sidelight story, one night in the early 80's I remember sitting in a booth at the North End Depot with my brother Rob and telling him that story of me and Dad. I said, for all I knew we were sitting in the same booth that Dad and I had sat in. Rob, being a big fan of family history, was intrigued by the story and the possibility. For the few memories I have of my dad, Rob had fewer. He said he kind of remembers a couple of things, but even those details were hazy. I always felt bad for him and Paul, as they never really knew him and really had no memories to pull from. It's my guess that Rob's having one big catch-up session in heaven right now and part of me is jealous of what he's finding out. I guess my turn will come. 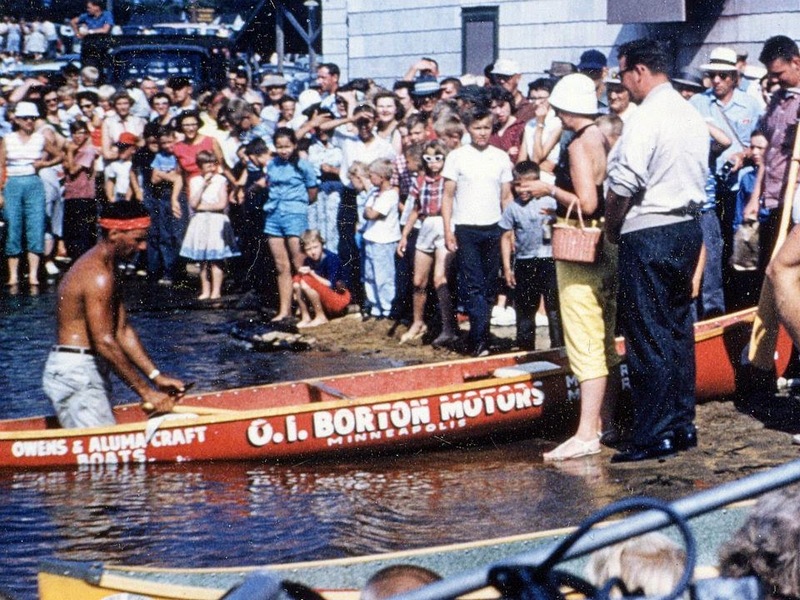 I guess if Dad had one epic outdoor moment that will live on, it would have to be his second place finish in the Aquatennial Canoe Derby in the 1950's. He and his brother Dan raced from Bemidji to Minneapolis and despite nearly disowning each other by race end, managed to take second place. It was a grueling 456 mile race over almost 3 days. There is still some controversy over the alleged winners having taken a shortcut, but second place is still pretty impressive in my eyes. I guess I'll be getting the full details on that adventure someday too. So, that's a little bit about another Dirty Shirt character. 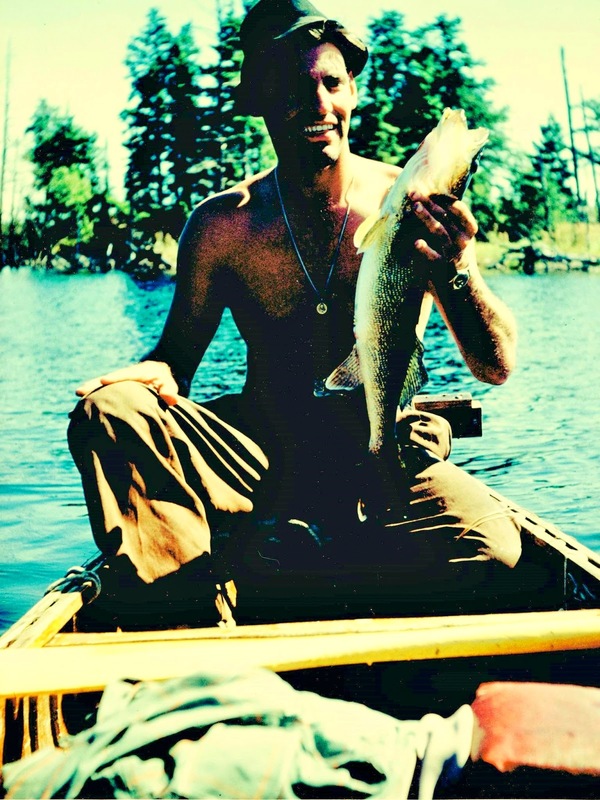 One of my favorite pictures of him has him holding a nice walleye in a canoe in the BWCA sometime in the 60's. He looks happy, healthy and handsome, much like my brothers and I back in the 80's. We went there seeking fishing and fun and in some weird way, we came to know him better through our time in the wilderness. It was time well spent. If you want to find out more about our encounters with our father from the past, well, you'll just have to read the book. You won't be disappointed. I know that writing about him certainly helped me understand him a lot better, as well. It's good that you have some memories of your dad. I like the outdoors, too, so I am looking forward to reading your book. Yes, you are definitely doing some smart marketing with your character peeks. Thanks Phil. As I mentioned last week, the real hero in the family is my mother who was left to deal with 6 kids in the wake of his death. I know you had your own issues with your dad and came out a better man in the end, a testament to the grace of God. I think you'll enjoy the book.